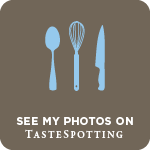 I love participating in various food events, these food events will definitely pull us to come with creative dishes. For this month of july, am hosting a wonderful event called Celebrate-Olympic games, this event is owned by Jagruti of Jagruti's Cooking Odyssey. July is going to be a celebration month in London coz of Olympic games. I love watching olympic games,definitely i'll support Indian team virtually to the core.Obviously guest hosting an event with olympic games as theme will definitely going to be more fun.Thanks a lot to Jags for letting me to host this event and am so happy for it. Coming to the theme of this event,you can cook anything from starters to desserts from the countries participating in Olympic games,the dishes you are sending should be cooked in any country participating this Olympic games in London to be a part of this wonderful event. Even if you dont live in those countries participating Olympic, its will be really interesting to give a try to their foods. Wat a lovely chance to explore different cuisines na. So friends, do cook many dishes and its time to try and taste different dishes from other countries.Thanks again to Jags for making this logo for me. 1. Cook Any Dish from Any Country participating in Olympic games for the event.Post vegetarian /non Vegetarian recipes for the event. 2. Entries posted from 1st - 31st July 2012 is acceptable. 3.Please link your entries using the linky tools here. 4. Please use the event logo and its not compulsory. Your entry post should contain the link to this event announcement and Jagruti's Event Announcement.Its mandatory. 5. Multiple entries are welcome. If any of your previous posts qualify for this theme, you can send them too, provided it is re posted with the link to the event announcement. 6. Non-bloggers are invited to participate in the event. You can mail me your recipe and a photograph of the dish to the mail id Priyasuresh09@gmail.com. Looking eagerly your creative and delicious entries. The weather is not stable at all in Paris, actually its summer here but since a week either its raining or its too hot. After a week of nasty weather, yesterday its was too hot suddenly. We were running behind chilled juices and ice creams for the whole day. This peach lemon cooler was quite a fantastic refreshing drink,i simply prepared for us with soda yesterday. 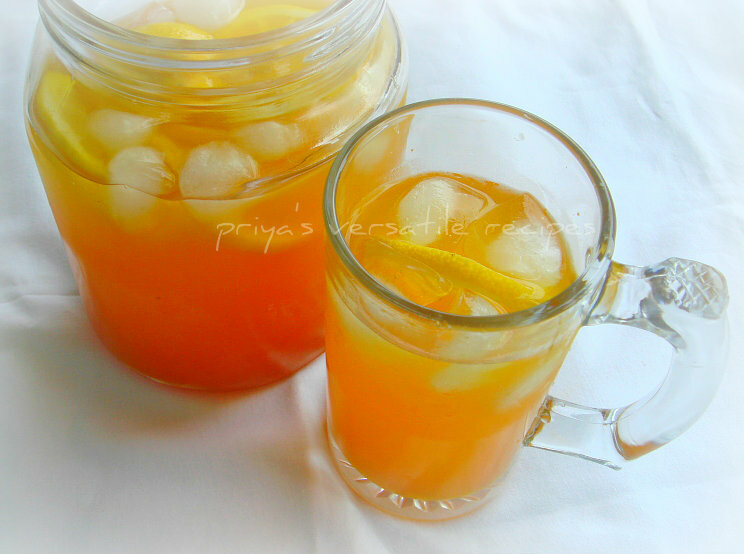 This cooler is quite refreshing and suits prefect for this super hot weather.Sending to Divya's Showcase-Fun in Sun. Blend the chopped peaches with sugar and strain the juice. Take the soda and lemon juice together in a large vessel, add the peach juice, give a stir. Serve immediately with ice cubes.Enjoy! 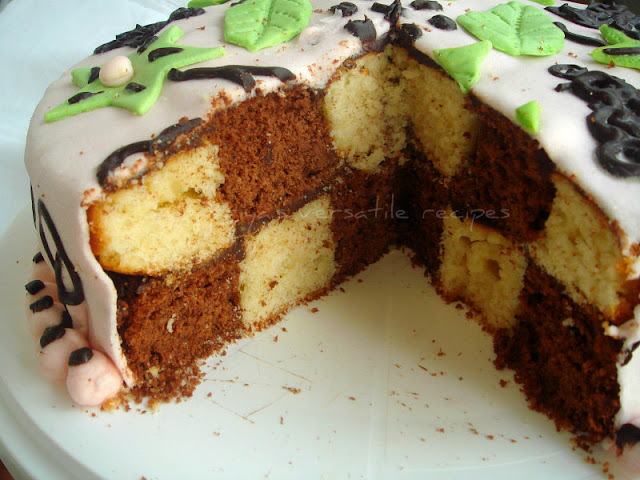 When i wanted to prepare a marvellous birthday cake to my daughter at home itself, the first cake came to my mind is this checkerboard cake. I know its really worth to try this cake eventhough this cake is super time consuming, i spend almost a day to bake a cake,making a fondant,a ganache and assembling finally the cake. But watelse a mom want to prepare for her lovely sweet gal. I started making earlier in the morning itself a vanilla yogurt cake with a round pan and used the same pan for making the chocolate yogurt cake. I checked here to make sure before assembling the cake, but since i dont have any specific pan or utensils to cut the cake, i went for a paper cutting. 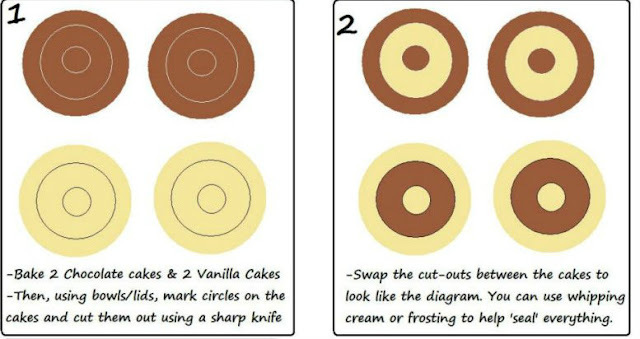 I prepared three thick paper circles and used them for slicing my cake. Prepared a quick chocolate ganache for sealing the cake together and covered the cake completely with a simple and easy breezy fondant prepared with marshmallows and confectioner's sugar. I'll be posting soon how i prepared the fondant, am sure this will be definitely helpful to most of us. Coming to this checkerboard cake, they came out simply awesome, needless to say more the pictures itself speaks a lot na. You can make this cake easily at home without the specific checkerboard cake pan, just use your usual cake pans and slice them using a simple paper cuttings. Worth to try especially for celebrating a birthday or an anniversary. Preheat the oven to 350F. Sieve both the flour and baking powder and keep aside..
Take the eggs, sugar in a bowl and beat everything until they turns soft, now add the vanilla sugar, oil and yogurt to the sugar-egg mixture and beat again everything for a while. Gradually add the dry ingredients to the wet ingredients, mix gently with a spatula until everything get well mixed. Pour this batter into a greased baking pan and bake for 20-25minutes in middle rack until a skewer inserted comes out clean.Keep aside let the cool completely. Preheat the oven to 350F, sieve the flour and baking powder and keep aside. Take the eggs and sugar in a bowl,beat everything until the mixture turns smooth, add the oil,yogurt to this mixture and beat again for few more minutes. Add the melted chocolate, flour to the wet ingredients and mix gently with a spatula until everything gets well mixed. Pour this batter into a greased baking pan and bake for 20-25 minutes in middle rack until a skewer inserted comes out clean..
Take the chocolate chips and cream in a vessel,heat it until the chocolate gets well melted..mix well and let them sit in fridge for an hour. Cut the thick paper as large,medium and small sized circles according to the size of your baked cake.Slice the top of the baked cakes to equalize them.Using a sharp knife and the paper cutting, cut the cake as three circles. Arrange the cake as shown in picture 2 and spread the prepared ganache to seal one over an another slice. I went for two layered checkerboard cake with two cakes. Frost your cake with a buttercream frosting or simply use a fondant to make them more beautiful. You can prepare many layers as you wish to make your cake taller as you want. 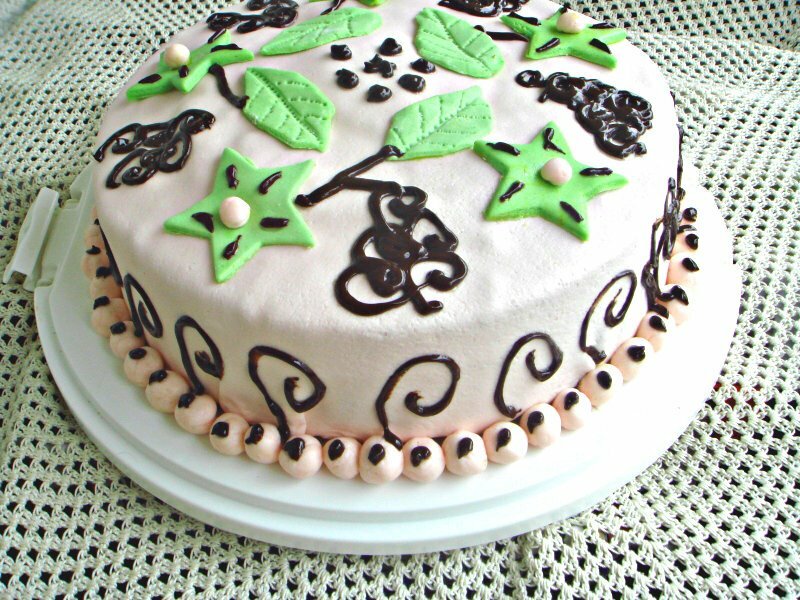 You can use food colours to make this cake more colourful and catchy. This cake is my first trial and they came out simply awesome. Today my daughter is celebrating her birthday,i was somewat busy in making an elaborate south Indian lunch today. To celebrate this day i prepared my first ever fondant cake yesterday with a checkerboard cake inside.To be honest, i never went to baking class or cake decorating class till today, but somehow i wanted to make a different cake specially for my daughter for her birthday with fondant. Thanks to Youtube, i watched how to make fondant since few days with various links before start making fondant with marshmallows. I choosed rose coloured marshmallows for making this fondant, i dont have any particular cutters and utensils. I simply used my star shaped cookies cutter and used scissor to cut down the fondant as leaves. Actually i was bit nervous, eventhough for me this fondant cake turned good. I posted this picture in Facebook to get an idea about my friend's view, omg their responses was tremendous. I got loads of encouraging,lovely and motivating words. Thank god,am blessed with wonderful friends around. We are going to cut the cake today evening and i'll update the checkerboard cake under the fondant soon. Stay tuned friends. 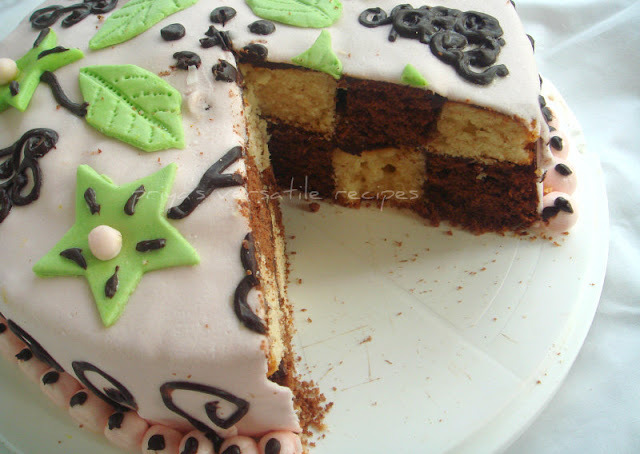 I prepared a simple vanilla and chocolate yogurt cake for preparing this checkerboard cake, thanks again to Youtube. You can get an idea about this cake if you check out youtube. I'll post soon a detail post for this cake, sorry friends have to prepare for today's evening birthday party. If you are searching for a delicious nutty and super delicious stir fry with chicken, you should definitely give a try to this incredible cashew chicken. I have tasted this cashew chicken in a chinese restaurant recently,immediately i have completely fallen in love with this yummy dish. Last week, i wanted to recreate the same chicken dish at home and got the famous Hoisin sauce for making this dish. Am always a bit skeptical because of the smell of this hoisin sauce and always fear that the dish is going to taste the way as the sauce smells. Thank god, fortunately it never happened, this store bought hoisin sauce gives a wonderful flavour to this dish. 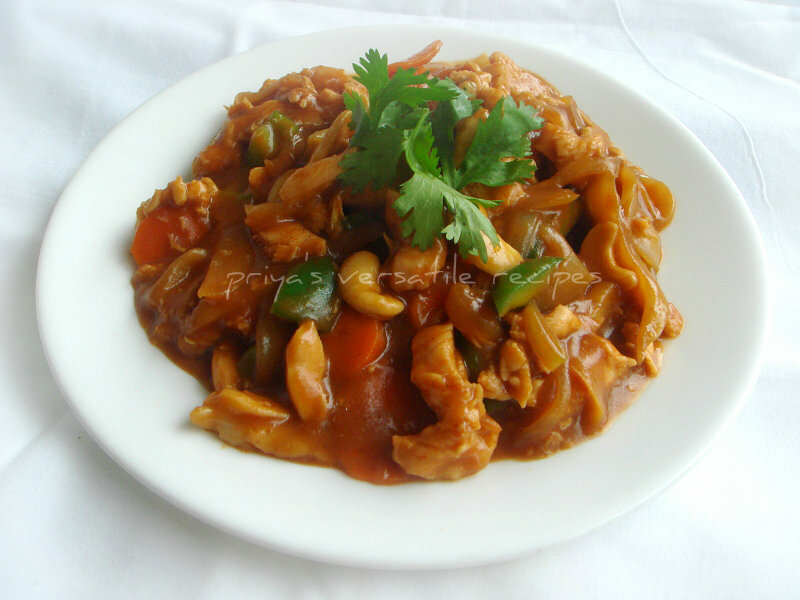 Enjoy this nutty chicken stir fry with a bowl of rice, am damn sure you will definitely have a filling and fantastic lunch or dinner.Sending to Divya's The Master Chef Contest. In a bowl, take the cornflour,vinegar, hoisin sauce,sriracha chilly sauce and mix everything well until they turn as a thick sauce,keep aside. Meanwhile mix the chicken pieces with salt and pepper and add to the wok. cook for few minutes. Now add the already prepared sauce and cook for 2-3minutes until the sauce turns thick.. Finally add the chopped coriander leaves or green onions. 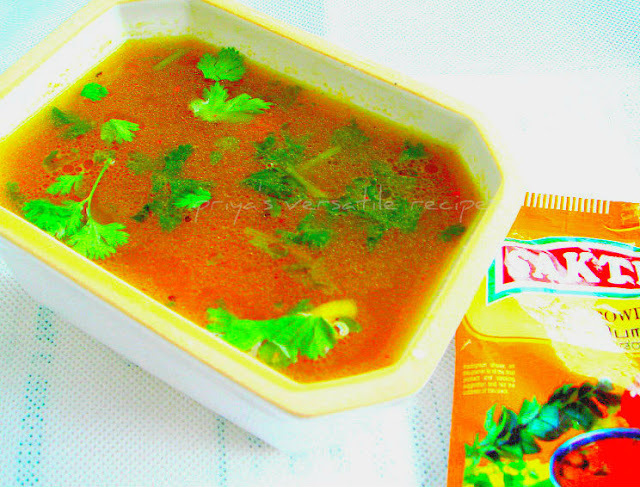 Rasam is definitely a comforting food for many of us, i can have this spiced soup even daily with a bowl of rice. We have our homemade rasam powder and i never stopped myself preparing them. As most of us do, before leaving to India, i cleaned all my spice powders,my pantry also my freezer and fridge. Everytime after a long journey,i know that the first food we would like to have back home for our lunch or dinner will be definitely rasam. Thats why i didnt forget to pick some store bought rasam powder from India,since a long i wanted to try Shakthi brand rasam powder and picked them immediately.Eventhough i have my homemade rasam,powder, i do make rasam by combining both the homemade and store bought rasam powder. Personally i loved this brand rasam powder and prepared a super delicious pumpkin dal rasam with this store bought powder few days back for our lunch. Serve with spicy potato fry,this rasam tastes seriously divine.This is my third and final post for this week's blogging marathon, do check out the other bloggers running this 17th edition of blogging marathon here. 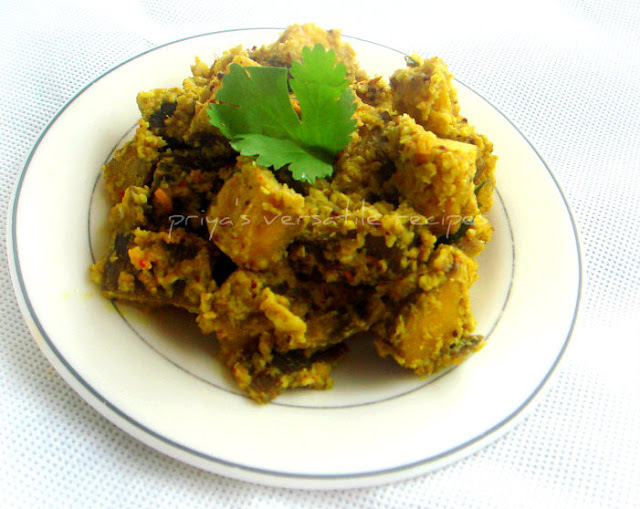 Pressure cook the chopped pumpkin,washed toordal together with turmeric powder upto 3 hisses, once the steam released, blend the cooked pumpkin and dal together as fine paste. Take this pumpkin-dal paste in a vessel with crushed garlic cloves, crushed tomatoes, rasam powder,curry leaves with enough salt and water together in a bowl. Heat enough oil and add the mustard seeds, cumin seeds, dry red chillies,slit opened green chillies and asafoetida powder and let them fry,add the pumpkin-dal water. Serve hot with rice and any spicy side dishes. Most of our dinner goes for salads and sandwiches, needless to say i have to make variety of sandwiches to satisfy everyone's tastebuds at home. Obviously most of our sandwiches will definitely have veggies,cheese and very much rarely meats. Sometimes i prepare our dinner sandwiches simply with cooked beans spiced with pepper powder and salt. For a change this time i used tortillas and mixed beans for making this healthy,filling,nutritious and definitely a healthy sandwich for our dinner. I used rajma,black-eyed peas,chickpeas,horsegrams and red chori beans for making this healthy mixed kababs, instead of deep frying i went for shallow frying and this wraps gets ready very easily.I went for a quick yogurt sauce to spice up my wrap and served along with few sliced tomatoes.You can also go for any sort of beans for making this kabab and personally i felt that either rajma or chickpeas works out prefect for making this wonderful kabab wrap. Sending to my own event Healthy Diet-Sandwiches hosted by Kalyani. Soak the mixed beans overnite and pressure cook upto 3 hisses with enough salt and water,once the steam get released, drain the cooked water and keep aside the cooked beans. Take the cooked beans in a large bowl, add the chopped onions,chopped green chillies,garam masala powder, amchur powder, ginger garlic paste,chopped coriander leaves,corn flour, rice flour and salt, mash everything well. Make medium sized oblong shaped kababs and shallow fry them with enough oil. Meanwhile mix the yogurt,pepper powder and salt and keep aside. Heat the tortilla in a hot pan until they turns warm. Take off from the pan, spread the already prepared yogurt sauce as per need. 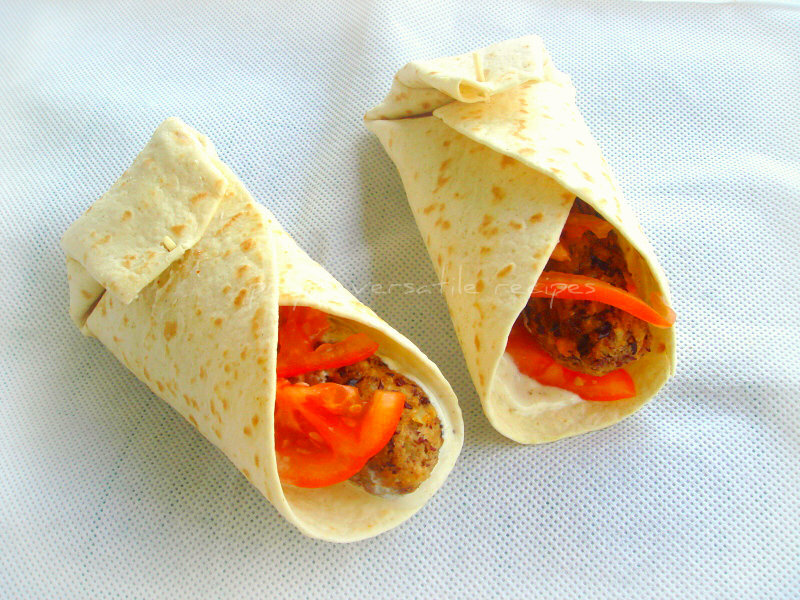 Place the shallow fried mixed beans kabab over the spread, arrange few tomato slices and fold them as wrap. After bisi bele bath, my all time favourite one pot meal is this vangibhath. I can survive for many days with these both dishes, i dont even need any side dish for having this both dishes anytime. I always have few homemade spice powders in my pantry,i usually prepare most of my dishes with those homemade spice powders. I do prepare quite often vangibhath and bisi bele bath spice powder eventhough i love this MTR vangibhath spice powder.As i told earlier, i picked this MTR vangibhath powder during our vacation last year in India,i prepared already twice vangibhath with this store bought powder with eggplants, they came out super delicious and i wanted to prepare something different with legumes and eggplants to give a twist to this usual vangibhath. Immediately i choosed rajma for making this vangibhath, both rajma and eggplants together works out terribly awesome and we loved having this super flavourful vangibhath for our lunch simply with potato chips. Obviously with this store bought vangibhath powder, your vangibhath will gets ready super quick and its quite helpful to cook up easily this vangibhath quite often even if you very much busy with other stuffs.Just add any sort of legumes and veggies to give a twist to this usual vangibhath.Do check the other marathoners running this 17th edition of blogging marathon here. Heat enough oil, let fry the mustard seeds,channadal,urad dal and dry red chillies,now add the cashewnuts and curry leaves and fry until the nuts turns brown. Now add the cubed eggplants,cook for few minutes until the veggies shrinks a bit, immediately add cooked rajma, tamarind paste,vangibath powder,salt and cook everything in simmer until the oil gets separates. Finally add the cooked rice,dessicated coconut and toss everything gently until everything gets well mixed. Serve hot with chips or fryums. As i told earlier, our blogging marathon took a new avatar this time and from this month onwards, we guys will be running 3 days of non stop blogging. 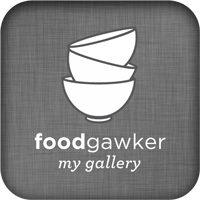 I have already run three weeks of blogging marathon, this week i choosed an interesting theme called cooking with readymade stuffs. Being a passionate cook, i love cooking food from scratch,but somehow sometimes i love foods prepared quickly with readymade stuffs. Last year,when we went to India, i couldnt stop myself buying many store bought spice powders for making different dishes, obviously we came back here with loads of readymade spice powders. One among those spice powders was this tamarind rice powder, initially i dont want to pick this powder. But my H was surprised to see this spice powder and insisted me to get them by saying may be a day he will make some tamarind rice with this readymade spice powder. But it never happened coz he dont have enough time to cook also he was quite busy with his office stuffs. When i choosed this cooking with readymade stuffs, i immediately wanted to finish this powder and prepared few days back this tamarind rice. Seriously this spice powder is super handy,prefect for bachelors and definitely very quick to prepare your rice.Do check the other marathoners running this 17th edition of blogging marathon here. Heat enough oil,let fry the mustard seeds,urad dal,channadal,curry leaves,dry red chillies and asafoetida powder until they turns brown. Add the cooked rice, tamarind rice powder, toss everything gently and put off the stove. Serve this yummy tangy rice after an hour with any side dish of your choice. 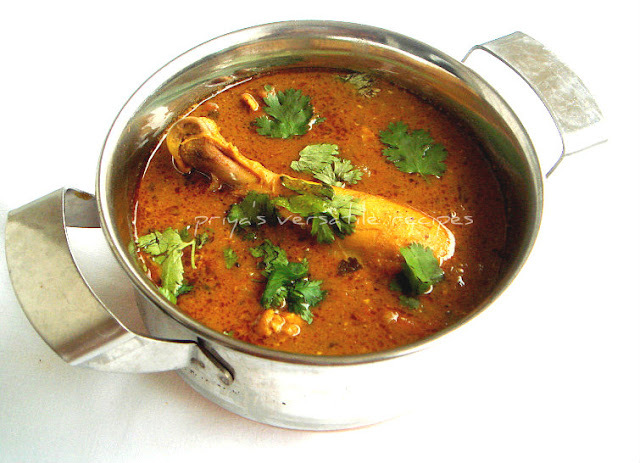 I was planning to make a different type of chicken gravy since a long,after making out of variety of dishes here comes a Bengali style chicken gravy. When i talked with one of my close friend from Pondicherry, she asked me to try out a Bengali chicken gravy called posto murgi she watched in a cookery show long back and she suggested me to give a try as she already prepared twice and its was a big hit at her place.. Immediately i took notes from her and tried out making them few days back at home. Oh god, she wasnt wrong, this posto murgi tastes simply awesome when served with a bowl of hot steaming rice. Suits absolutely incredible even as side dish for rotis, we simply loved it. If you dont have Kashmiri red chilly powder, you can use usual red chilly powder in this gravy, anyhow adding Kashmiri red chilly powder gives a wonderful colour and mild spiciness to this delicious gravy.Sending to Divya's The Master Chef Contest. Marinate the chicken with garam masala powder,turmeric powder,salt and lime juice and keep aside for half an hour. Heat enough oil, fry the bayleaves. Add immediately the chopped onions,ginger garlic paste and saute until the raw smells goes away. Now add the marinated chicken, cook everything for few minutes. Meanwhile grind the soaked poppyseeds, green chilles as fine paste and keep aside. 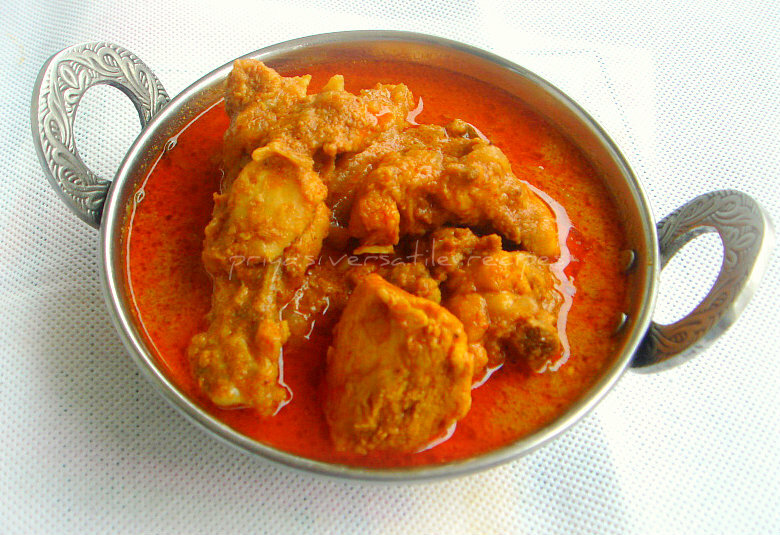 Add the kashmiri red chilly powder, grounded poppy paste to the cooking chicken, cook everything for few minutes again. Now add enough water and cook until the chicken gets well cooked and the gravy gets thicken.Serve hot with rice. We usually use chironji seeds aka saara paruppu in almond kheer and for garnishing while making some sweets apart from it i never used those seeds in anything. 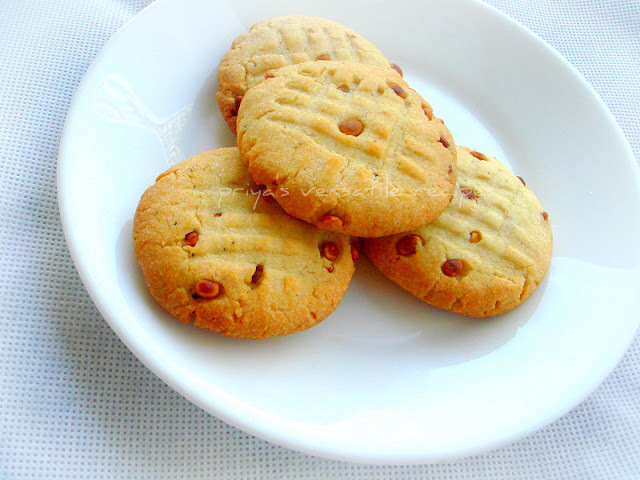 My sweet tooth start craving from some cookies and i went for making some cardamom flavoured butter cookies. Initially i wanted to add some cashews in this cookies,but i couldnt able to put my hands over the box i stored cashews, finally i went for adding this chironji seeds as they were sitting in my pantry since few months. Adding cardamom powder gives more flavour to this super buttery and addictive cookies while these chironji seeds gives a wonderul nuttiness to this cookies and tastes fabulous while munching these cookies.Sending to Kid's Delight- Evening snacks guest hosted by Vardhini,event by Srivalli. Preheat the oven to 350F..Mix together the sugar,flour;chironji seeds and salt in a large bowl, add gradually the melted butter and cardamom powder,mix everything well. Use the milk as per need to form a soft dough, make small balls from the soft dough, flatten them as small disc. Place them over a baking sheet lined over a baking tray, using a fork make some impressions over the flattened disc..
We get rarely raw papaya here in Indian grocery and i never failed to pick them. As usual back home,i'll wash and peel them,then chop them as medium sized cubes and freeze them for further use. Its quite precious for us here even its a simple vegetable you guys get very easily in India. Thanks to the one who invented freezer else we couldnt add them atleast once a while those rare Indian veggies for us in our diet. Last week,i felt somewat lazy to cook some dals for our lunch, finally i prepare this quick and fingerlicking healthy kootu through pressure cooker within few minutes. Both raw papaya and urad dal together works out wonder and this kootu suits super prefect with hot steaming rice as well as with dosas or idlis. 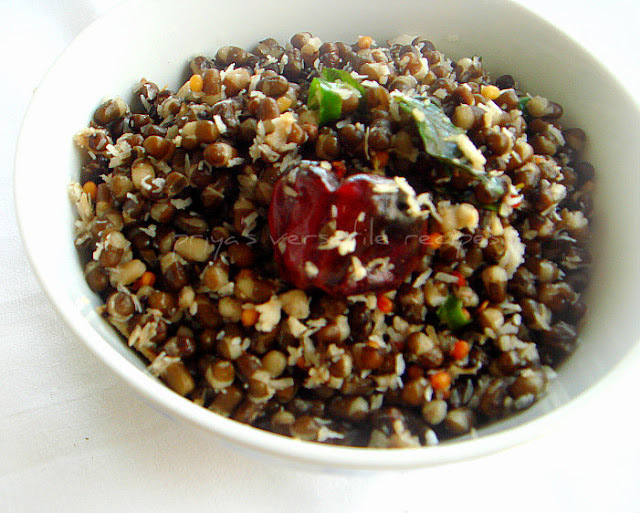 I combined both urad dal and moongdal for making this kootu,you can skip completely the urad dal in this dish but somehow since ever i tried making dals with urad dal with other dals i got hooked completely to them. I couldnt stop myself adding dehusked urad dals in my recent dals based gravies.Sending this fingerlicking kootu to my own event CWS-Black Gram guest hosted by Shri. Roast and grind all the ingredients given under the list 'to roast & grind' as fine powder. Heat enough oil, lets splutters the mustard seeds,urad dal,asafoetida powder, fry the red chillies until brown, now add the onions,chopped tomatoes,slit opened green chillies,curry leaves and saute until the veggies gets well cooked. Add the cooked dal-raw papaya mixture,already prepared spice powder to the cooking veggies,cook everything for few minutes,put off the stove.. Serve hot with papads along with rice or simply with dosas.. Whenever i have some leftover masala served for lunch with rice, later in the evening i'll finish them either as side dish for rotis or as a filling for making sandwich.But this time, i prepared specially a quick,spicy and delicious mushroom masala for making as a filling to stuff my last night dinner's sandwiches. This yummy and super filling sandwich goes for a fingerlicking mushroom masala, it tastes simply awesome and super delicious when stuffed between two bread slices. Everyone at home simply loved having this delicious sandwich.Sending to my own event Healthy Diet-Healthy Sandwiches guest hosted by Kalyani. Heat enough oil in a pan, fry the crushed fennel seeds, add immediately the chopped onions,chopped tomatoes and ginger garlic paste,saute until the raw smell goes away. Add the chopped mushrooms,salt,red chilly powder,garam masala powder and coriander powder,cook everything in simmer until the masala turns thick.. Finally add the chopped coriander leaves and put off the stove. 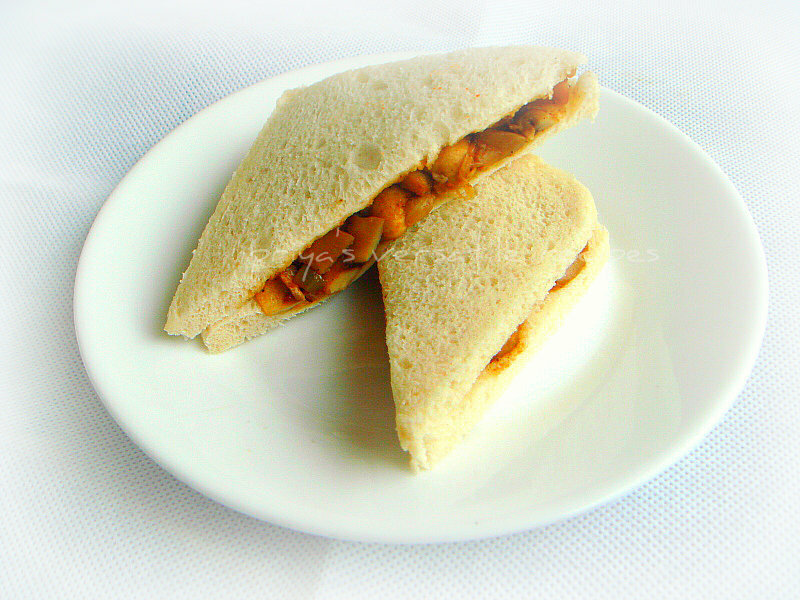 Spread gently the already prepared mushroom masala over a bread slice, cover it with an another slice of bread and serve as sandwich. Have you ever tasted Haagen-dazs dulce de leche icecream, oh boy its our family favourite icecream. I can finish a 500ml pot within few minutes, just love it that much.Two days after preparing some homemade Dulce de Leche, i prepared this eggless dulce de leche icecream at home without an ice cream maker. So guys just prepare some short cut dulce de leche at home easily and do prepare this delicious fake haagen-dazs style of dulce de leche. I have no words to say how tasty this icecream was, i couldnt stop having myself and we finished this icecream within three days. Fantastic icecream gets ready very much easily and will definitely vanish very soon too.Sending to Kid's Delight- Evening snacks guest hosted by Vardhini,event by Srivalli. Heat the whole milk and bring boil, add the dulce de leche and cook for few minutes. Now keep aside and let them gets cool completely..
Whish the heavy cream, dulce de leche-milk mixture together well for few minutes, now transfer this mixture to a stainless box or in a box and arrange in freezer for an hour. 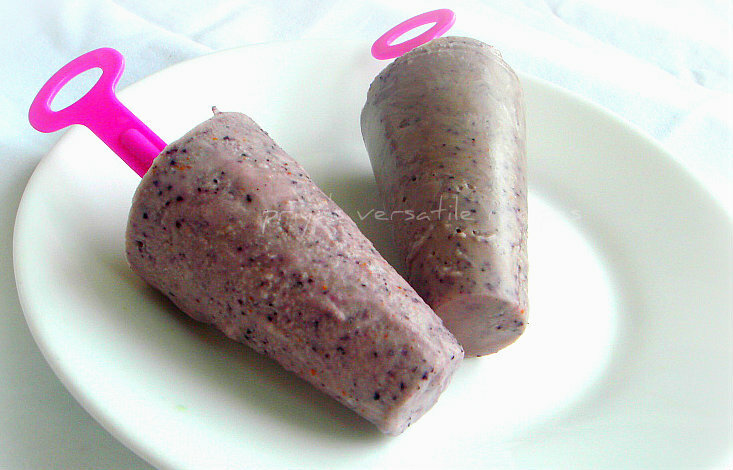 After an hour,take out the slightly freezed icecream and beat them for few seconds in a blender and pour it again to the box. Freeze it for overnite. I rarely cook red meats and make atleast twice a week chicken, i dont keep their skin and remove them completely. I feed easily my picky eaters anything with chicken, thats why i usually cook them with greens. 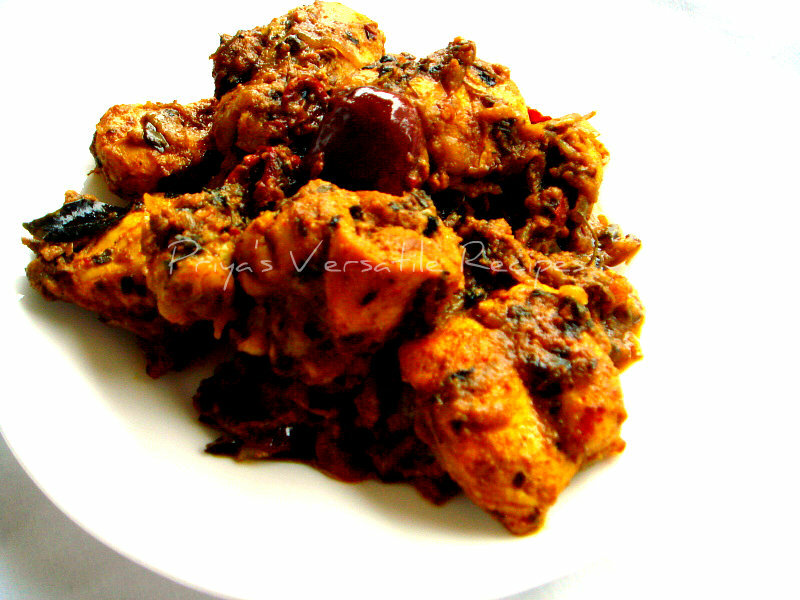 This time i prepared a quick,easy and definitely a delicious chicken with methi leaves. This roast goes for easy breezy preparation and suits absolutely prefect as side dish for rotis as well as along with rice. I loved this methi chicken roast with hot piping rasam for my lunch and loved with simple chapathi for my dinner. Methi leaves gives a wonderful flavour to this simple chicken roast. Adding methis to a simple chicken roast is an excellent way to sneak this bitter greens easily.If you are a vegetarian, you can make this same roast very well with potatoes,cauliflowers and with paneer. Marinate the chicken with chilly powder,salt, yogurt and keep aside for half an hour. In a kadai, heat enough oil, fry the fennel seeds and dry red chillies, add now the chopped onions,ginger garlic paste and cook until the onions turns transculent. Now add the marinated chicken, coriander powder and cook them for few minutes. Add the chopped fenugreek leaves to the cooking chicken, cook everything in simmer. Sprinkle some water and cook everything for few minutes until the chicken roast turns dry. Do we need any reason to enjoy some deep fried beauties? definitely no. As i told earlier we are entering the summer here. Kids are having their hectic days with exams and late night studies,just two more weeks and they will be in summer vacation for 2 months. Yesterday, we had a super rainy day, our day itself started with a super heavy rain and later in the evening it was pouring like anything. Needless to say that we felt like having some hot deep fried fritters with a cup of coffee or tea. I have soaked some whole urad dal overnite for making some dal makhani but finally i ended them making this pinched fritters. Actually my mom makes a bonda with split deskinned urad dal with whole black peppers and sliced coconut bites, for a change instead of making balls with the urad dal batter, i went for this pinched version. These crispies were quite addictive,goes awesome even as side dish. We couldnt stop ourself having this crispy fritters and everyone at home just enjoyed a lot.You can enjoy thoroughly this incredible fritters in many ways with the choice of your favourite chutneys or sauces.Sending to Kid's Delight- Evening snacks guest hosted by Vardhini,event by Srivalli.. Grind the soaked whole urad dal with enough salt and water as bit coarse paste, add the coconut pieces, crushed black peppers and curry leaves. Heat the oil for deep frying, once the oil gets hot,pinch the already prepared batter and drop gently to the hot oil, fry until the fritters turns golden brown. Do fry in small batches and drain the excess of oil with a paper towel. Enjoy for snacks with a cup of tea. Weekend we had a simple lunch but with a flavourful chicken curry, i tried Kerala style chicken curry which is well known as Naadan chicken curry.This yummy fingerlicking chicken curry tastes simply awesome when they are served with any kind of dish, yep they suits very well either with a simple white rice or a flavourful and rich ghee rice. Tastes more delicious even when served along with rotis. I got this recipe from Niya's world, she always makes me hungry with her yummy dishes and when i wanted to make this Naadan chicken curry,i immediately went to her space to check her chicken curry. I got hooked to her irresistible chicken curry and tried without any hesitation for our sunday lunch. Thanks to Niya for sharing this super flavourful Kerala chicken curry.Sending to Kerala Kitchen guest hosted by Julie and to Divya's The Master Chef Contest. Wash and marinate the chicken with half a spoon of chilly powder and salt,keep it aside. In a heavy bottomed pan, heat the coconut oil, fry the chopped onions, slit opened green chillies,grated ginger,curry leaves and crushed garlic,cook until the onions turns transculent. Now add the marinated chicken with chilly powder, coriander powder, chicken masala powder,turmeric powder and cook for few minutes until the chicken gets half cooked. Add the thin coconut milk and enough salt,cook everything in medium flame until the gravy turns thick, finally add the thick coconut milk and immediately put off the stove. Once you add the thick coconut milk dont let them boil. None at home never said no to anything cooked with paneer, obviously i cook many variety foods with this incredible Indian cheese. Somehow i missed posting our favourite kheer with grated paneer in my space, when i choosed payasam and halwas for this blogging marathon, i wanted to post our family favourite paneer payasam. But unfortunately i didnt have enough paneer to make payasam,finally i went for adding roasted rolled oats,one of my favourite whole grains to this usual paneer payasam. This paneer oats payasam turned out super delicious,highly addictive and gets ready very much easily. You can skip the oats and make your payasam completely with grated paneer in case if you dont have oats at home. Quite an easy breezy payasam to enjoy warm and am damn sure everyone at home will thoroughly enjoy this super yummy payasam anytime of the day. Do check the other marathoners running this 17th edition of blogging marathon here.Hope you guys enjoyed thoroughly payasams and halwa i posted for the last three days in my space. Bring boil the milk, now add the sweetened condensed milk, grated paneer and cook for few minutes until the paneer gets bit dissolved. Now add the roasted rolled nuts,cardamom powder to the cooking payasam,cook for few more minutes and put off the stove. Serve warm topped with sliced pistachios and almonds. Every christmas, my neighbour from next door never forget to give us a basket full of dry fruits, every time we finish that whole basket very much quickly especially those fabulous dates from Morocco. But somehow, none at home loved the dry apricots from that basket this time,so i freezed them immediately for further use. When i thought of making halwa with fruits for this week's blogging marathon, immediately those frozen dry apricots came to my mind, i thawed them and soaked them overnite for making halwas the next day through microwave oven. As am making halwa with apricots for the first time, i dont want to make a huge quantity and went for a trial with a cup of soaked apricots. Oh my god, for my surprise this halwa turned out seriously super delicious,glossy and quite addictive.Whoever told no to those dry apricots, simply relished this irresistible halwa. Needless to say that i tried again twice this halwa and finished completely those dry apricots i freezed.Cooking time in microwave oven varies according to the power of your microwave oven.Do check out the other marathoners running this 17th edition of blogging marathon here.Sending this yummy halwa to MEC guest hosted by me,event by Srivalli.Sending to Akila's Dish name starts with-M. 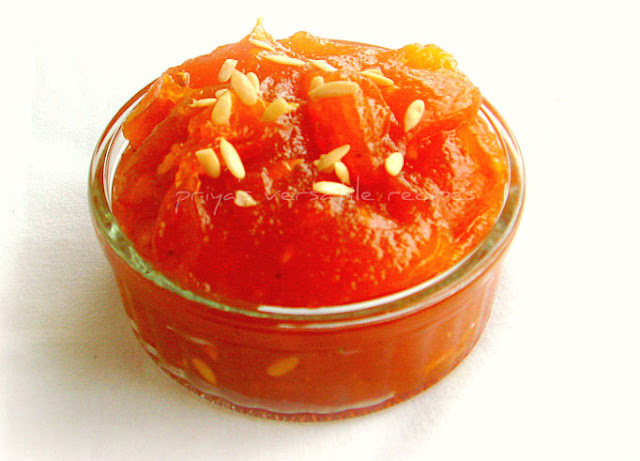 Grind the soaked apricots with sugar as thick paste.Take this thick apricot paste and the food colour in a microwave safe bowl,mix well and cook for 10 minutes in high. Give a stir every 3 or 5 minutes, add the ghee, nuts and cook in high again for 5 minutes..finally add the cardamom powder and stir again..
A glossy apricot halwa is ready. Enjoy warm or chilled. I never combined mango and moongdal together in payasam, when i choosed payasams or halwas as my 3rd week's theme of blogging marathon, the first thing came to my mind is to make a payasam out of this yummy combo. Yep guys here is going to be my third week of blogging marathon and stay tuned to watch out my next two posts under the theme payasams or halwas.Do check out the other marathoners running this 17th edition of blogging marathon here. Coming to this mango and moongdal payasam, its quite an easy breezy dish gets ready in very less minutes. 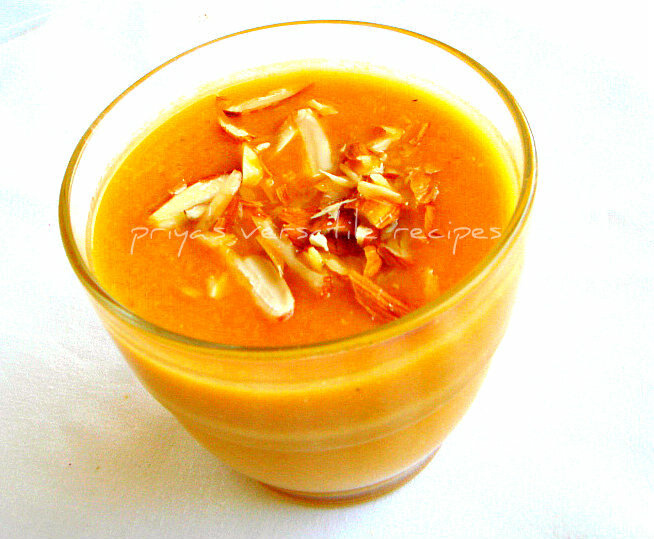 I used jaggery syrup for making this payasam,thats gives a fabulous taste and a wonderful colour to this dish. You can also use sugar but somehow i felt using jaggery as it gives a delicious taste to watever they are added. 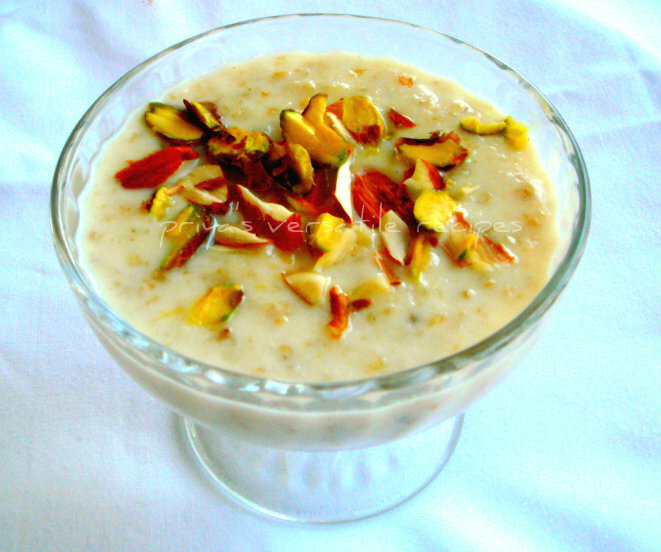 If you want to make a quick payasam when you have sudden visits or for a prasadams, this payasam will suits definitely for it.You can enjoy this payasam either warm or chilled, an addictive payasam to be enjoyed without any hesitation.Sending to Akila's Dish name starts with-M.
Wash twice and take the moongdal,cubed mangoes with enough water in a pressure cooker,cook upto 3 whistles, once the steam get released, mash well the dal and mango together. Add the jaggery syrup,cardamom powder and ghee to the mashed dal-mango mixture, cook for few minutes until they gets bit thick.Put off the stove immediately. Add the fried cashew nuts or sliced almonds while serving. Cover the jaggery with enough water and cook until they gets well melted,put off the stove, immediately strain this jaggery syrup and use it. When Jagruti of Jagruti's Cooking Odyssey asked to me for a guest post, i immediately said ok.Seriously i wanted to make something specially for her. 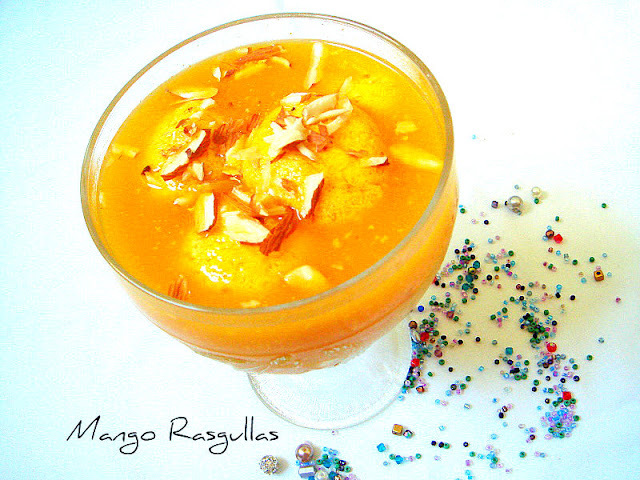 As i know she loves very much mangoes i combined my favourite famous Bengali sweets rasgullas with her favourite fruit mango, both together makes a wonderful exotic and super delicious spongy juicy rasgullas.Am so happy that Jags loved my guest post and she just posted this guest post in her space today.Do check out here. Coming to this rasgullas, i used thick mango pulp while preparing the sugar syrup and this mango rasgullas were quite addictive,extremely delicious. My lil one who rarely love mango based desserts simply enjoyed having this super juicy rasgullas. Take the milk in a heavy bottomed vessel,bring boil and keep stirring to avoid burning of milk..
Once the milk comes to boil, start adding the lemon juice and keep stirring,put the flame in simmer and cook for few seconds until the milk solids gets separates from the whey.Switch off the heat. Pour this curdled milk to the already lined muslin cloth over a strainer,squeeze out all the whey water and rinse the milk solids/paneer under water and squeeze out the water as much as possible.Place a heavy weight over the drained milk solids/paneer to squeeze out the water completely. Take the paneer in a vessel,mash it well and knead for few minutes until they turns soft...make medium sized balls from the smooth dough, take care not to have any crack on the ball. Boil the water in a pressure cooker,add the sugar,cardamom powder and mango pulp to the water,bring to boil. Add the already prepared paneer balls to the cooking syrup. Put the lid and cook till 3 hisses. Once the pressure gets released,open the lid and transfer the mango rasgullas to the bowl and let them cool completely. Arrange in fridge for an hour before serving topped with sliced almonds. Srivalli choosed stuffed kulchas for this month of Indian Cooking Challenge, actually this challenge is our last month's challenge but for some reason we couldnt able to post it. Kulchas are flattened and a type of leavened bread made from all purpose flour aka maida. These breads are quite often prepared in India and Pakistan. Kulchas are famous bread from Punjab, usually this bread is baked in earthern clay oven until they turns golden brown, once baked its usually rubbed with butter and served with spicy side dishes. I have already prepared many varieties of kulchas and this time i used onion stuffed kulchas for this challenge. Srivalli shared 3 types of filling,immediately i choosed onion stuffed kulchas as i have already paneer and aloo anardana stuffing. Everyone at home loved this super flavourful kulchas,thanks to Srivalli for this wonderful challenge.I skipped brushing the kulchas with butter and served simply with paneer butter masala. Take the all purpose flour,baking powder,baking soda,sugar,salt,oil and yogurt in a large bowl and knead as a smooth dough with enough water and keep aside. Let it sit for 2 hours. Meanwhile mix well the chopped onions,chopped chillies,ajwain seeds,grated ginger and cumin seeds and salt in a bowl. Divide the already prepared dough as small pieces and roll them as small circles with a rolling pin. Place the enough onion filling in the center of the rolled circles, bring all the sides together to close the filling completely. Press it well. Now roll it down gently as medium sized circles and keep aside. 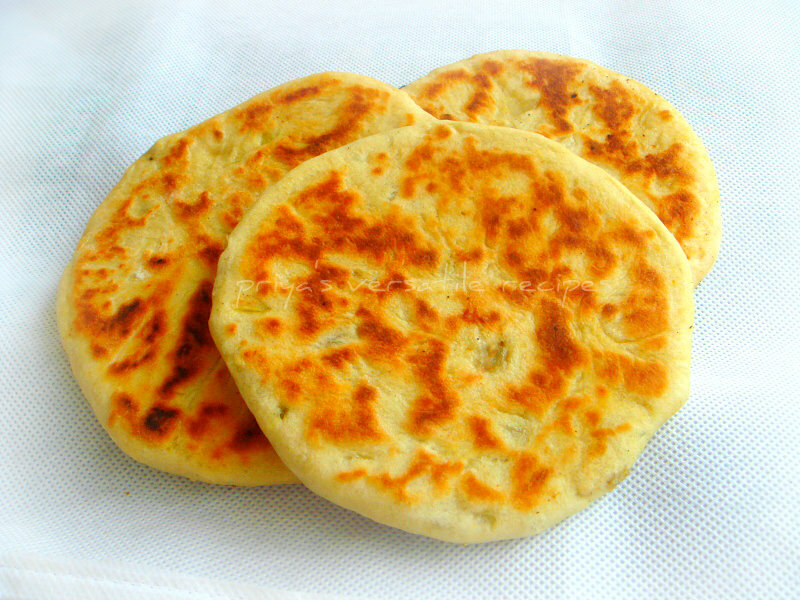 Heat a pan in a stove in medium flame and place the already prepared kulchas. Drizzle enough oil on all the sides of kulcha and cook well until the brown spots appears. Serve hot with spicy channa masala or paneer butter masala. A super delicious stir fry prepared with raw banana cubes along with a grounded paste of coconut,green chilly,cumin seeds and garlic. This is how Keralites prepare their raw banana, seriously this thoran is one of my most favourite dish from their cuisine. Serve this thoran with hot piping rasam, you will definitely love this combination and both together tastes absolutely divine.Easy breezy stir fry gets ready easily and you can enjoy even as a simple snacks, yep i usually finish them as a snack if there is any leftover after our lunch. You can also add any kind of beans to this thoran to turn them as a protein rich stir fry.Sending to Kerala Kitchen guest hosted by Julie. Grind all the ingredients under the list 'to grind' as fine paste and keep aside. Meanwhile cook the cubed raw bananas in water with turmeric powder and salt until they get cooked. drain the water. Heat the oil, let splutters the mustard seeds,urad dal and curry leaves, now add the cooked raw bananas, grounded paste and salt(if needed) and cook until the raw bananas get well coated with grounded paste. 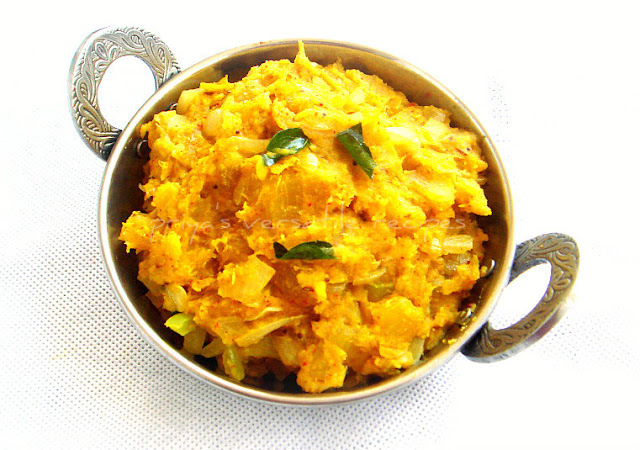 Serve as side dish with rice and dal. Saw this whole black urad dal sundal in a TV cookery show long back, immediately i took a note of this healthy and nutritious snack.Last week i prepared a cup of this sundal,oh boy its tastes super yummy,nutritious and similar to the whole green gram sundal. Definitely i'll recommand everyone to give a try to this super healthy,delicious and guilt free snacks. Even my teddies enjoyed having this sundal for their evening snacks.Sending to my own event CWS-Black Gram guest hosted by Shri. Soak whole urad dal overnite, cook in a pressure cooker with salt and enough water upto 3whistles, strain the water and keep aside.. Finally add the cooked urad dal,salt,grated coconut and toss gently everything for few minutes and put off the stove..Enjoy warm.. I buy very rarely blueberries,last week when we went to our farmer's market i couldnt stop myself buying some fresh blueberries. Back home,i prepared this yummy,healthy and nutty smoothie for our yesterday's breakfast and this smoothie was super satisfying with a beautiful eye pleasing colour. 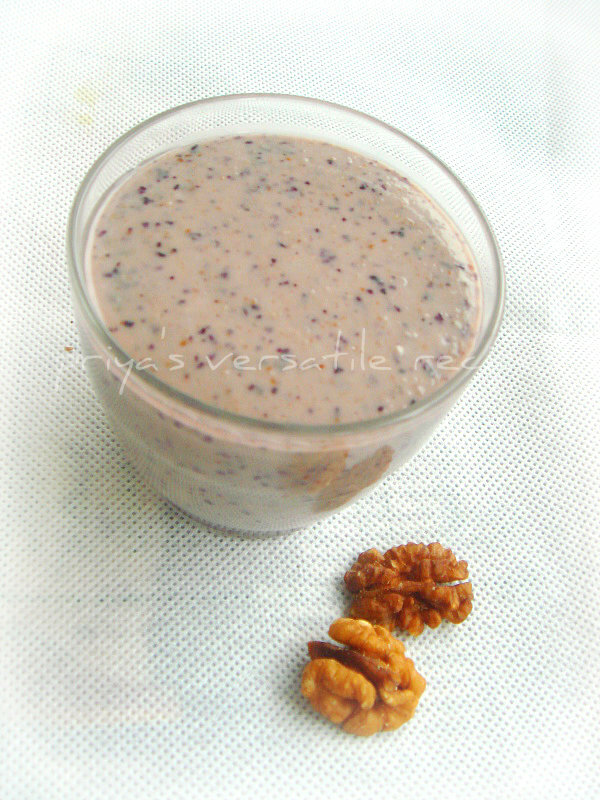 A prefect,highly filling and delicious breakfast smoothie to enjoy without any guilt to kick start a day. If you dont get blueberries,you can go very well for strawberries or raspberries for making this smoothie.I used raw rolled oats in this smoothie,if you dont like adding as though you can cook them until they soft and add while blending the smoothie. Am damn sure everyone at home will definitely love having this smoothie anytime of the day.Sending to Veggie/Fruit A month-Blueberry guest hosted by Harini,event by Priya and to Indrani's Spotlight - Summer Cooler. Take the blueberries,oats,walnuts,yogurt and enough honey in a blender, blend everything as a thick smoothie and serve immediately. In case if you dont like thick smoothie, add some water while blending..
For this month's of Bloghop Wednesdays,i was paired with Santhosh Bangar of Santhosh's Kitchen. Oh my god, she have loads of super delicious dishes from North India in her space and seriously i took almost a week to decide wat to choose and cook for this month's bloghop. Initially i wanted to prepare her papad samosas to which i got hooked immediately, but few days back while going through her space to prepare something for iur evening snacks. I simply loved her super tempting poha dish prepared with a lovely combination of veggies, i didnt even hesitated a second to try it and prepared immediately for our evening snack. This jhatpat poha tastes simply delicious,with loads of veggies this poha was super colourful and definitely super flavourful all coz of the addition of garam masala.Seriously i loved the addition of the garam masala in this dish. 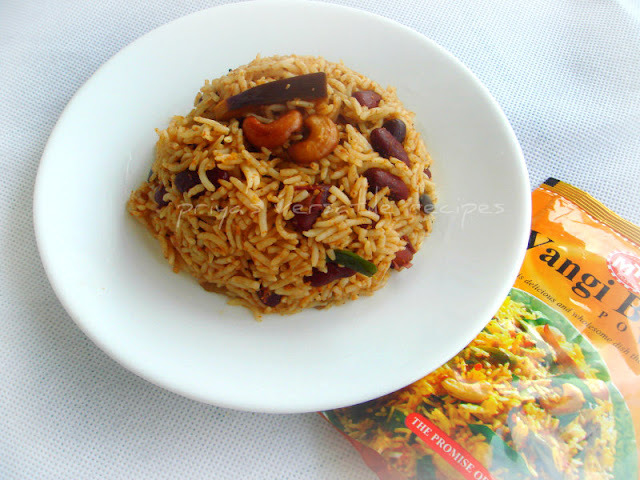 Thanks to Santhosh for sharing this quick,easy breezy and fantastic jhatpat poha. Everyone at home simply loved it. Heat enough oil,let crack the cumin seeds and curry leaves, add the chopped carrots,frozen greenpeas and sweet corn,chopped green chillies and saute for few minutes until the veggies turns soft. Meanwhile wash the rice flakes with water and drain the water immediately and keep aside. Now add the washed poha,garam masala and salt and cook for few more minutes. Finally add the lemon juice and put off the stove. Enjoy warm as snacks or for breakfast with ketchup. My love for Kerala cuisine push me quite often to try their delicious dishes. Few day back i got some fresh tapiocas aka Maravallikizhangu from a chinese store. Instead of pressure cooking and having for snacks, i wanted to try this mashed tapioca as a well know dish from Kerala called kappa puzhukku.Since ever i learned this kappa puzhukku from my friend, i was planning to make them from a long,finally i tried them only few days back. In Kerala,tapiocas can be served at anytime of the day as breakfast,lunch or dinner and also even as snacks, this mashed tapioca can be eaten by itself or with a combination of any side dish. Keralites have this puzhukku usually with fish curries, but i served this mashed tapioca with rice porridge, both tastes fabulous together and we truly enjoyed this combo.Sending to Kerala Kitchen guest hosted by Julie and Akila's Dish name starts with-M.
Cook the diced tapiocas with enough salt and water until they gets well cooked,drain the water and mash it well. Meanwhile grind all the ingredients given under the list "to grind " as fine paste. Heat the coconut oil, let splutters the mustard seeds, add immediately the onions,curry leaves and cook until the onions turns transculent,add this to the cooking mashed tapioca. Toss everything gently and serve wam with rice or porridge. Few days back, i went for the usual monthly purchasing to Indian grocery, while going through the dry sun dried products section, i got hooked to these dry lotus root packet. Immediately i picked them and back home i wanted to try as my all time favourite vatha kuzhambu. I prepared this gravy without any expectation and went for usual preparation. Oh my god, these dry roots once get cooked turned out super yummy, tastes fabulous. 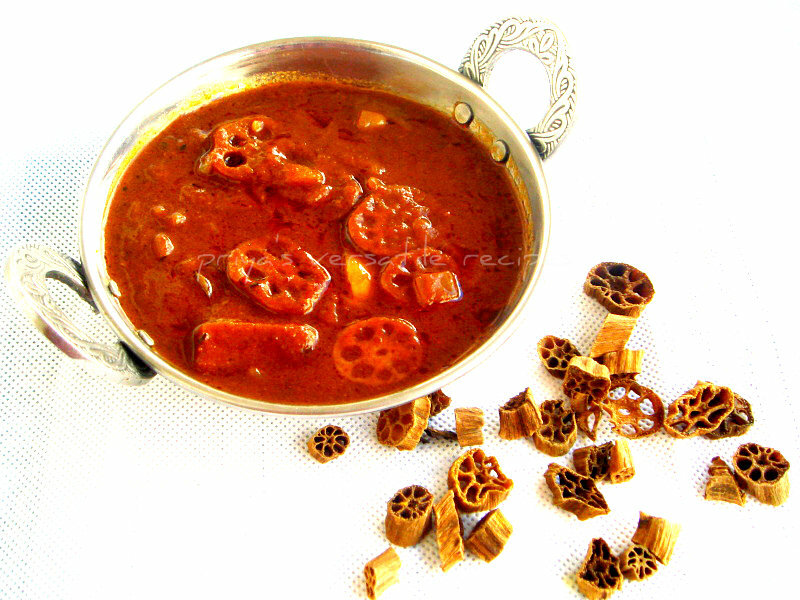 Most of us know that Vathal means vegetables which are sun dried,later they are used in gravy prepared basically with tamarind extract.You can add many vegetables like brinjal,drumsticks and potatoes to give a different flavour to this tamarind based sun dried veggies gravy, thats why i prepared this gravy simply with dry lotus roots and brinjals. Serve this super delicious gravy with hard boiled eggs or papads with hot steaming rice,am damn sure you guys will definitely love this fingerlicking gravy.This yummy gravy is my last post of this week's blogging marathon.Do check out the other marathoners running this 17th edition of blogging marathon here. Heat gingelly oil in a heavy bottomed pan, fry the mustard seeds,fenugreek seeds and curry leaves now add the dry lotus roots and garlic cloves and fry until they turns brown. Add immediately the diced onions,chopped brinjals and cook until the onions turns transculent and brinjals get partially cooked.. Meanwhile add the chilly powder,coriander powder,pepper powder,cumin powder,tomato puree and salt to the tamarind juice. Finally add this spiced tamarind juice to the cooking veggies, cook everything in simmer until the oil gets separates,the gravy constitency should be bit thick..
As i told earlier,here am posting my eggless version of mug cake i prepared through microwave oven, i used baking soda and yogurt as egg subsitute.This single serving cake is definitely delicious,quite addictive and a slice of cake just for you. 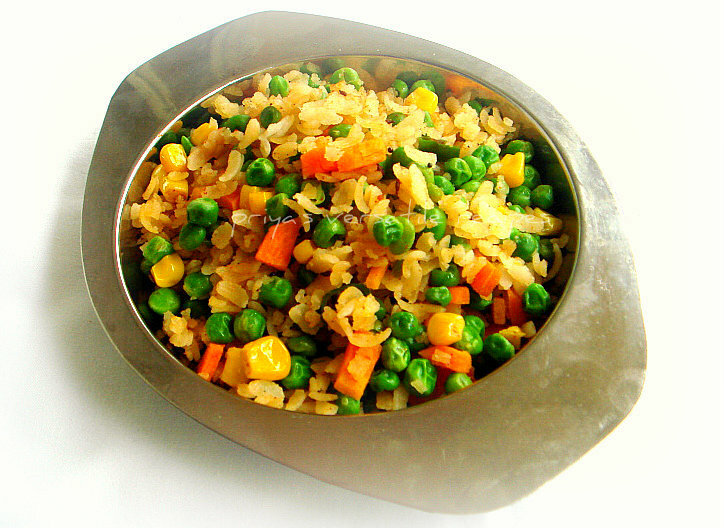 Just gets ready within less than 2 minutes through microwave oven and no need to wait for an hour. You can make different version of this mug cake either by simply mixing chocolate,vanilla,peanut butter, caramel,dulce de leche,nutella and why not cinnamon. You can make this simple and quick mug cake with anything and your cake gets ready easily anytime of the day whenever you feel like having this cake.Sending to MEC guest hosted by me,event by Srivalli and Kid's Delight - Wat Kids Love For Summer guest hosted by Smitha,event by Srivalli and Akila's Dish name starts with-M. Mix all the ingredients and whisk together as a smooth batter in a bowl and fill half of the coffee mug with this prepared cake batter. You can prepare two medium sized mug cake with this batter. Cook in high power for 1+1/2minutes - 2 minutes. Take care not to overbake otherwise you cake will turns rubbery. I have tried earlier dals with urad dal but along with a combination of toor dal and masoor dal,but never tried them alone. For a change, i tried this tomato and urad dal combo last week and i simply spiced it with sun dried buttermilk chillies. Last year, when we went to India, i asked my MIL to prepare some sun dried buttermilk chillies aka mor milagai for me to carry over here, she was kind enough and prepared specially for me a packet of these homemade sun dried chillies. 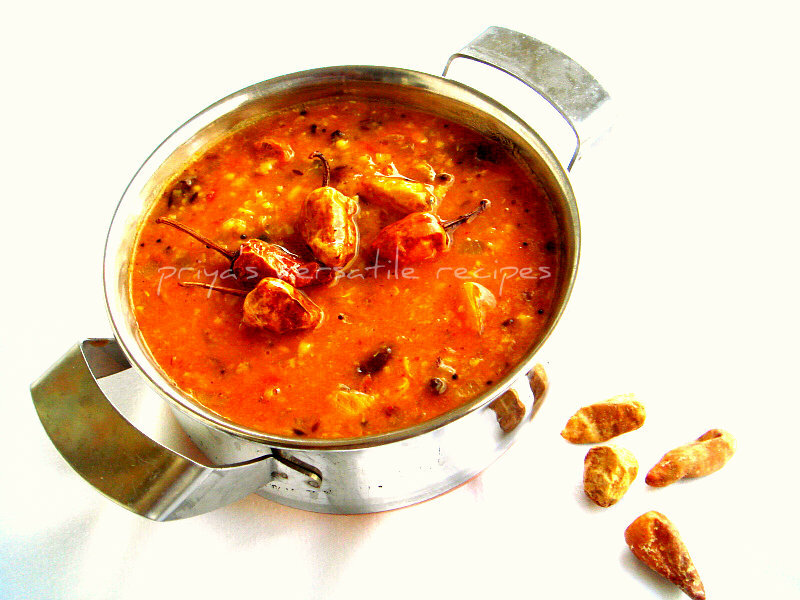 Just love to spice my tempered curd with this sun dried chillies but never tried them to spice a dal,keeping this on my mind while making this tomato and urad dal i used those sun dried chillies in tempering for spicing the dal. 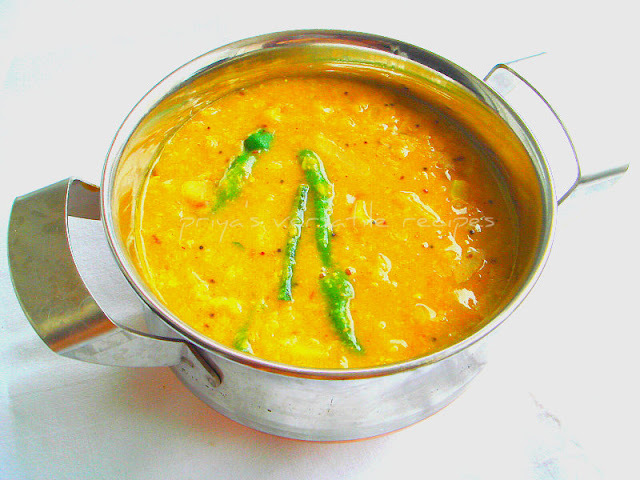 This dal was simply awesome, its was delicious,mildly spicy definitely a comforting food. We had this dal with rice and papads for our lunch. You can also serve this thick dal with rotis or idlis and dosas.Since am doing this week's blogging marathon with sun dried products as theme, this fingerlicking dal with sun dried buttermilk chillies suits prefectly.Do check out the other marathoners running this 17th edition of blogging marathon here. Sending to my own event CWS-Black Gram guest hosted by Shri. Wash the urad dal and take in a pressure cooker along with chopped tomatoes add 2cups of water and cook them upto 3 whistles, keep aside and let the steam get released. Mash them slightly with a spoon and add enough salt to the dal. Now heat enough oil in a pan, let crack the mustard seeds, cumin seeds,broken chillies,curry leaves and asafoetida powder. Add the chopped to the tempered spices and saute until the onions turns transculent, add this tempered spices and onions to the cooked tomato dal. Bring to boil and put off the stove immediately. Finally add the lemon juice and give a stir. 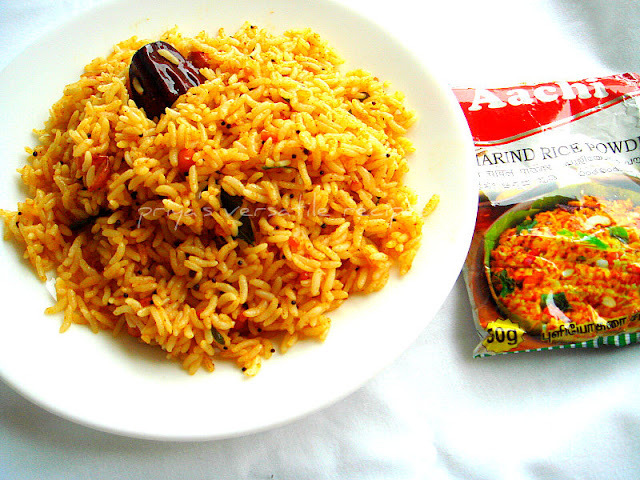 Serve with rice and papads. Our second week of three days blogging marathon starts from today, from today onwards i'll be posting recipes prepared with sun dried products for three days.My pantry will always have variety of spice powders anytime, most of the my spice powders are homemade. I never failed to make spice powders with variety of dals, i was seriously planning to make some spice powder using dry turkey berries or either with dry neem flower since a long. Recently i got parcel from India with many spices and obviously my mom have send me a medium sized packet of dry turkey berries. I dont have any excuse to make out my most awaited spice powder with dry turkey berries. 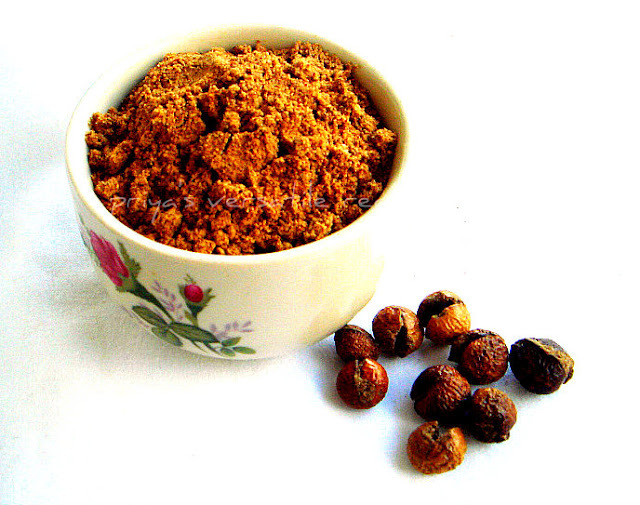 This tukey berries spice powder have many medicinal values and helps a lot for digestion eventhough its tastes bitter. You can have this spice powder simply with hot rice drizzled with gingelly oil or either you can add a spoon of this spice powder while making tamarind based spicy gravies, thats the way you can have this medicinal value rich spice powder quite often easily.Do check out the other marathoners running this 17th edition of blogging marathon here..Sending to my own event CWS-Black Gram guest hosted by Shri. Heat the gingelly oil in a pan, fry the dry turkey berries until they puff up. Remove the puffed turkey berries from the oil. In the remaining oil,fry the channadal,urad dal,dry red chillies,black peppers until the dals turns brown.let them cool completely. Now take the puffed turkey berries, dals with enough salt and grind as bit coarse powder. Store in an air tightened box and have once a week with rice or spice up your gravies with this spice powder. Making bread at home is a kind of therapy for me to get rid out of my stress, yep when the aroma of freshly baked bread fill the home definitely gives me more happiness than watching a comedy movie. 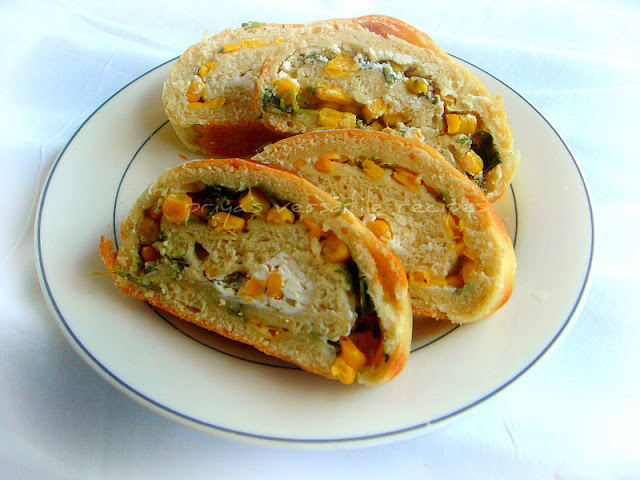 Obviously i do quite often breads at home,day before yesterday i prepared this yummy eggless cheesy corn and coriander swirl bread for our snacks. This bread tastes super delicious,with mild sweet and definitely aromatic coz of coriander leaves. Excellent bread to enjoy simply with a cup of coffee or warm milk for an evening snacks. You doesnt need any spread to enjoy this bread, i used low fat cream cheese in this bread.Since this cheese have enough salt,i didnt add any spices to spice them more. I simply went an easy breezy filling using this cream cheese along with canned sweet corn and few chopped coriander.You can feed cheese easily to kids by preparing this kind of swirl bread.This bread is definitely a keeper and am gonna make them quite often with different filling.I prepared two mini swirl breads with the given measurements.These swirl bread goes to Kalyani's Magic Mingle and to Street Party guest hosted by Shama,event by Jagruti, to Kid's Delight - Wat Kids Love For Summer guest hosted by Smitha,event by Srivalli. . .
Take the active dry yeast,salt and sugar in a luke warm water and keep aside for 5minutes,until they turns foamy. Meanwhile take the flour in a large bowl,make a well and add the foamy yeast,olive oil together,knead everything as soft and smooth dough. Arrange the dough in a greased bowl and keep in a warm place for two hours or until the dough gets doubled their volume.. Mix the cheese,sweet corn and chopped coriander leaves in a bowl and keep aside (you can add any kind of spices in this mixture). Preheat the oven to 350F..Now take the dough and roll as a thick 2 square discs by dusting enough flour, spread the already prepared filling over the rolled dough,give a press, roll the dough as a loaf.. Arrange rolled loaves in a two greased loaf pan and bake in middle rack for 20-25 minutes until the crust turns golden brown. Once they gets cool,slice it as per ur need. Enjoy warm with a cup of tea or coffee for snacks. Dulce de leche, a sweetened caramelized sauce is prepared with sweetened milk by cooking slowly in a heavy bottomed pan for few hours. The most easy and short cut method for making this yummy milk jam is using sweetened condensed milk. I wanted to share this fingerlicking sauce recipe since a long, i prepared this dulce de leche sauce last sunday and then later i prepared an eggless ice cream using them. 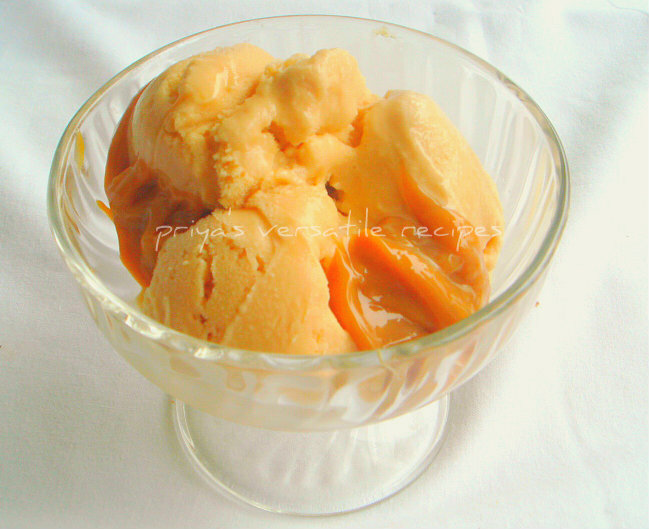 I'll be posting my version of this fabulous dulce de leche icecream very soon. This dulce de leche is called confiture de lait in French, french people use this sauce as spread in their bread,serve along with fromage blanc,a soft cheese.. This sauce can be used for making cakes,muffins,cookies and also for frosting cakes.You can make many delicious foods using this dulce de leche.I used my pressure cooker for making this dulce de leche, it took almost an hour for me to get ready.You can also make them using a heavy bottomed vessel very well..The cooking time will go for 3-4hours.Sending to Jagruti's Celebrate JCO~~Diamond Jubliee..
Heat the pressure cooker in high flame.Once the water starts boiling,put the flame in simmer and cover the cooker with the lid. Dont put the weight. Let it sit in medium flame for atleast an hour with lid closed (check frequently the water level,while checking dont open the lid immediately, keep them away from the flame and check it out..in case if the water is less than the top of the can do fill it and put back to the flame in simmer), the more you cook the more the colour of the sauce will be dark. Put off the stove. Keep aside for 4-5hours until it cools completely. 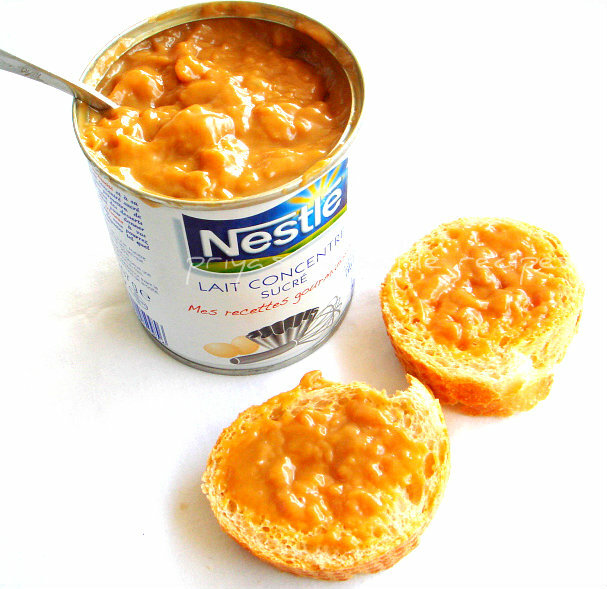 Open the can's lid and enjoy with your favourite food. I wanted to post this easy breezy mug cake since a long, i'll make them quite often whenever my teddies ask me to make some cake,but somehow i couldnt post them in my space.This time without any fail,i clicked a picture of this yummy and highly addictive cake. Eventhough my favourite is peanut butter chocolate mug cake, this nutella cake is always a winner and everyone at home just love it. Very soon, i'll post an eggless version of this cake, stay tuned friends. 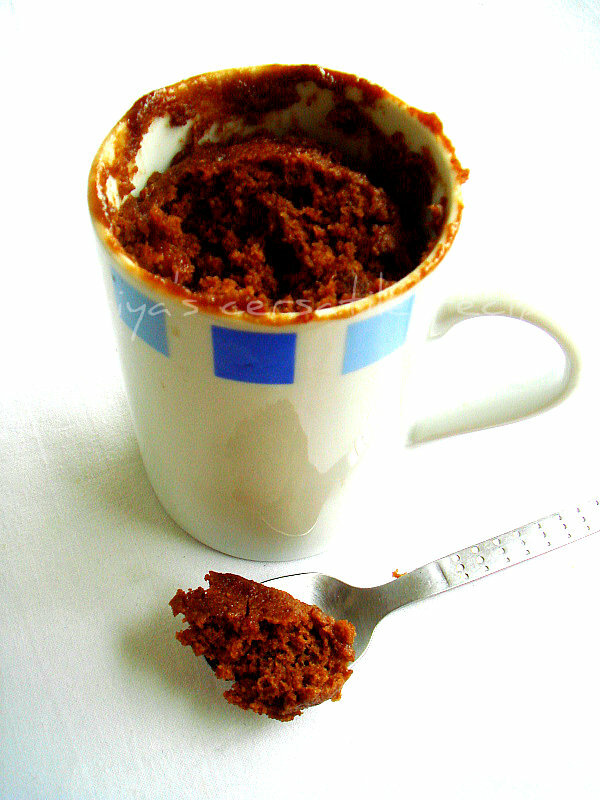 Yep i prepared an eggless mug cake today and we enjoyed thoroughly.Coming to this droolworthy nutella mug cake, this cake goes for quick preparation and mine is ready within 1m 30 seconds,yes it takes less than 2minutes to get ready. Serve this cake warm with a scoop of vanilla icecream, this combo tastes absolutely divine together.The measurement am giving here yields two medium sized mug cakes.Sending to MEC guest hosted by me,event by Srivalli, Kid's Delight - Wat Kids Love For Summer guest hosted by Smitha,event by Srivalli,Akila's Dish name starts with-M. Mix the flour,sugar,egg,baking powder, oil,milk and nutella in a bowl and fill half of the coffee mug with this cake batter. 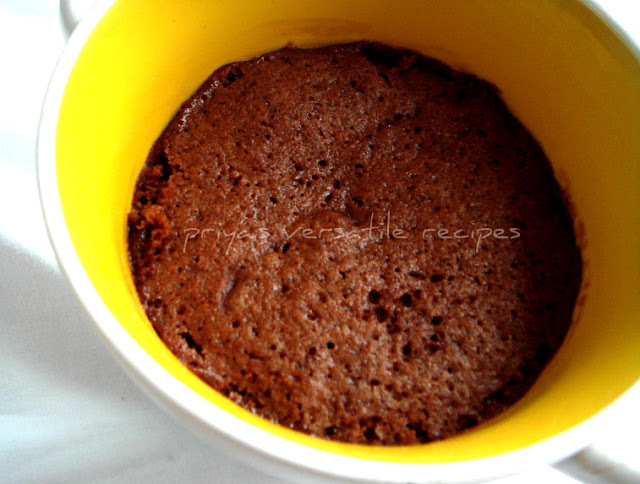 Cook in high power for 1+1/2minutes - 2 minutes..Dont overcook,else your cake will turn rubbery. I never get bored of making parathas aka rotis with different variations, one of our recent dinner was this super flavourful,nutritious,soft and yummy parathas. If you never had a chance to prepare urad dal parathas, definitely you guys are missing a super soft parathas,you should give a try to them. These parathas tastes fabulous when served simply with spicy coconut chutney and more tasty when served with kurmas prepared with both veggies or meats. The addition of ajwain helps for easy digestion also at the same time this enhance the flavour of this dish. 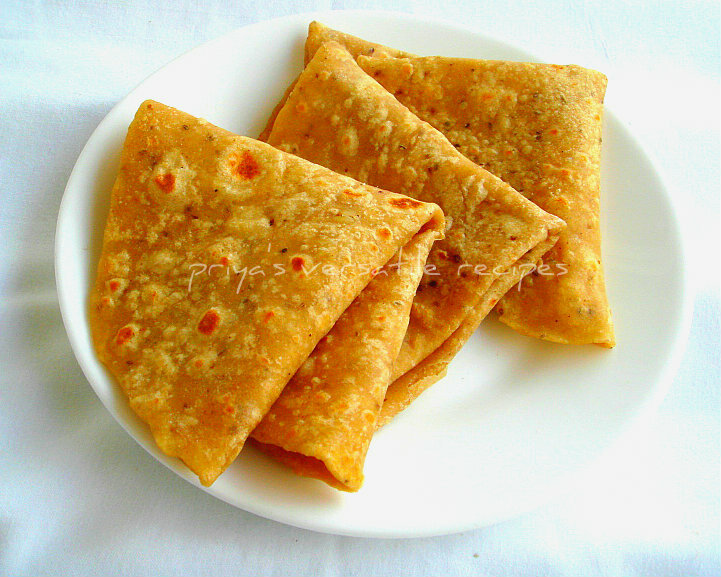 These parathas are really very quick to prepare and definitely a nutritious rotis to enjoy anytime of the day. I used split deskinned white urad dal for making this parathas, just cook them in pressure cooker,grind them as fine paste and make parathas with them. Take the wheat flour,crushed ajwain seeds,cooked and grounded urad dal paste with salt in a large bowl,gradually add the warm water and knead as smooth and soft dough. Keep aside half an hour, make medium sized balls from the dough,dust with flour and roll them as parathas..Meanwhile heat a tawa, drop gently the rolled parathas,drizzle few drops of oil,cook on both sides until they gets well cooked. Enjoy warm with any sort of chutneys or kurmas. 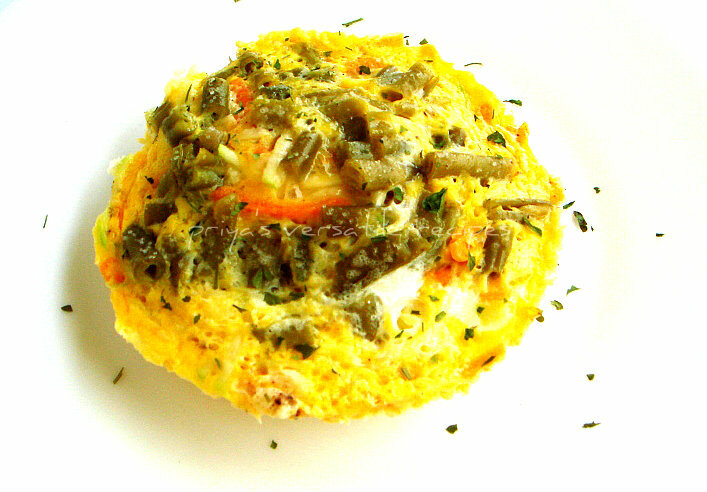 If you are having hard time in making omelette through stove top, give a try to this quick,almost oil-less omelette with loads of veggies.Whenever we feel like having a simple and quick dinner, we will definitely go for sandwiches with grilled meats,grilled veggies or either omelette with veggies.If i feel lazy to prepare omelettes through stove top, i'll make omelettes through microwave oven and serve them with bread toasts either for breakfast or for dinner. This single serving omelette will go for easy breezy preparation and they will get ready within 3 minutes if they are cooked in high power in microwave oven. You can use any sort of veggies for making this omelette,i prepared this wonderful looking omelette just before an hour for our dinner. Even a kid with an adult help or an bachelor can make out this quick omelette through microwave oven anytime of the day.Sending to MEC guest hosted by me,event by Srivalli. Remove the cooked omelette and serve with bread toasts. Kachoris, i came to know about this stuffed flaky deepfried breads only before few years, when i prepared them with onions for Indian cooking challenge.Weather is getting worst here, before a week its was too hot and suddenly its raining and the climate is completely dull and chilled. 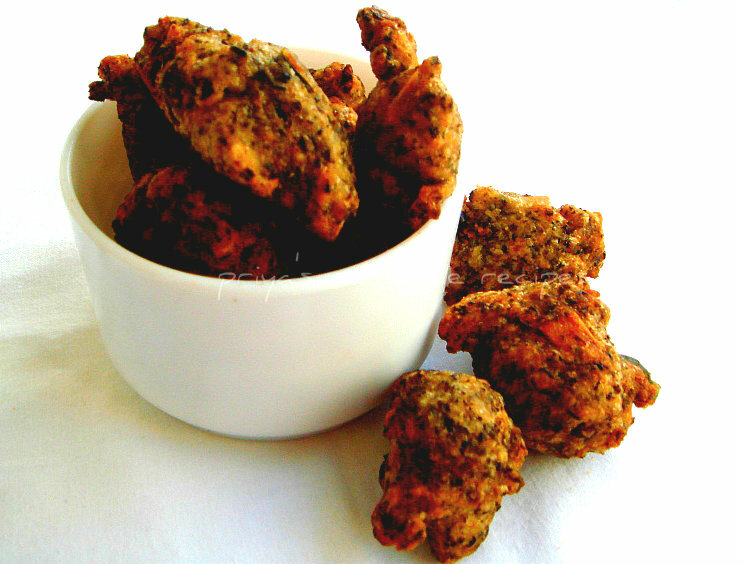 Obviously we need some crispy deep fried beauties for our snacks to munch with a cup of tea. I got hooked to whole black urad dals since i tried them in medhu vadas and couldnt stop myself in adding them in my recent dishes.When Kalyani announced this month's magic mingle with all purpose flour and coriander leaves, i thought immediately of making some kachoris with black urad dals. 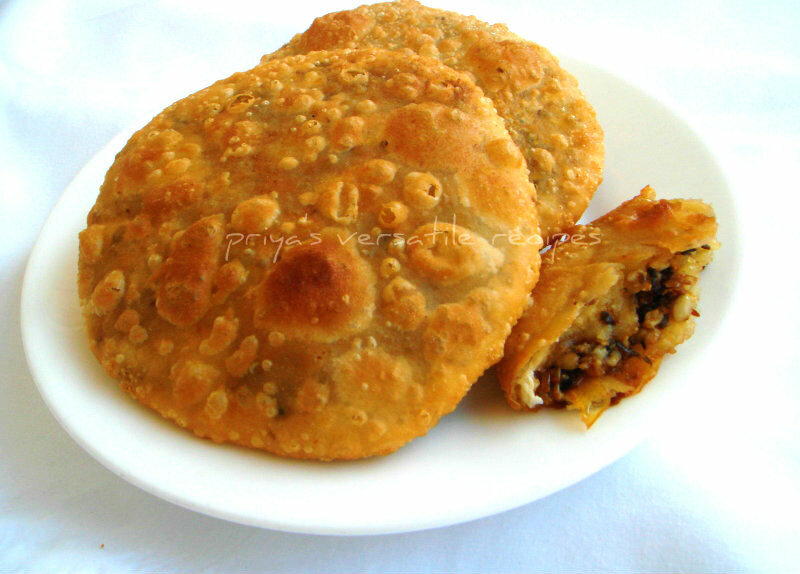 Coming to this kachori, they turned out super crispy with a wonderful,nutritious filling. We couldnt stop ourselves having these kachoris, i prepared almost 10 kachoris and they vanished very much quickly once i finished deepfrying. You doesnt even need any side dish to have them, the spiciness of the filling itself suits prefectly to enjoy with a cup of tea. Just imagine having this kachori with a cup of masala chai while its raining outside, mouthwatering na.Sending to my own event CWS-Black Gram guest hosted by Shri, Kid's Delight - Wat Kids Love For Summer guest hosted by Smitha,event by Srivalli. and Street Party guest hosted by Shama,event by Jagruti..
Soak the whole urad dals fro atleast 6hours or overnite,while preparing drain the water and grind as coarse paste (dont add water not even a drop). Heat enough oil, let crack the ajwain seeds and cumin seeds, add immediately the chopped onions,chopped green chillies and saute until the onions turns transculent. Now add the urad dal paste,chaat masala and salt, cook everything in simmer until the filling turns dry. Finally add the chopped coriander leaves and put off the stove. Meanwhile knead a soft and stiff dough with maida,oil and water and keep aside for half an hour. Make medium sized rolls from the dough..roll gently with the rolling pin. Place 2 tsps of the urad dal filling in the center of the rolled dough.Cover the filling with the dough by slowly stretching it over the filling. Seal the ends and remove excess dough,roll gently again with rolling pin. Meanwhile heat some oil for deep frying,fry the kachoris in batch in medium high flame.Cook for about 6 to 10 minutes till they gets a golden brown.